Getting into the College of your Choice involves Planning. This College Planning Checklist from the Department of Education helps parents and students get a head start in their College Planning and College Preparation. Preparing for College involves finding money for college education, taking the right classes in high school and having an idea of what career you might be interested in. In a speech to Congress on Feb. 24, 2009, President Obama encouraged every American to complete at least one year of education beyond high school, whether at a community college, or a four-year school, or through vocational training, or an apprenticeship. This checklist will tell you how to get ready for that education; and how the government will help you pay for it. A: Students (of all ages) who haven’t attended college or trade school, and parents of students in elementary and secondary school. A: A "to do" list, starting with elementary school, to help students prepare academically and financially for education beyond high school. Each section is split into subsections for students and parents, explaining what to do and which publications or Web sites might be useful to them. Getting a Late Start at College Planning? Have Questions and Want to Talk with a Real Person about Federal Student Aid? Just decided that you want to go to college, but school starts soon? Too late to do all the checklist items in this document? Here is your "must do" list. If School Starts Next Month! Apply for financial aid using the Free Application for Federal Student Aid (FAFSASM). Go to FAFSA Filing Time in this checklist, and follow the steps there to apply for available federal, state, and school funding. Ask the school you plan to attend what other financial help they can offer you: Do they have last-minute scholarships or payment plans available? Can you get a job on campus? Be sure to keep in touch with the school regarding any paperwork you need to turn in. If School Starts Next Week! Fill out your FAFSA immediately at www.fafsa.ed.gov; Use the "Live Help" option on the site, or call the Federal Student Aid Information Center for assistance. Talk to the financial aid administrator at the school you plan to attend. Ask whether there are other forms you need to complete, and find out how and when you will receive your financial aid. Federal student aid comes from the federal government; specifically, the U.S. Department of Education. It’s money that helps a student pay for education expenses at a postsecondary school (e.g., college, vocational school, graduate school). Federal student aid covers such expenses as tuition and fees, room and board, books and supplies, and transportation. Aid also can help pay for a computer and for dependent care. For details about the federal student aid programs, including maximum annual amounts and loan interest rates, visit www.FederalStudentAid.ed.gov/guide. Federal student loans offer low fixed interest rates; income-based repayment plans; loan forgiveness; and deferment options, including deferment of loan payments when a student returns to school. Generally, repayment of a federal loan does not begin until after the student leaves school. And did you know that a student receiving a federal loan does not need a credit history or a cosigner? Private loans from banks often do not offer such benefits. So if you need to borrow money to pay for college or trade school, start with federal student loans. How Do You Apply for Federal Student Aid? Refer to FAFSA Filing Time of this college planning checklist for a step-by-step guide to filling out the Free Application for Federal Student Aid. FAFSA4caster is a federal aid estimator that you can use before officially applying for aid using the Free Application for Federal Student Aid (FAFSA). FAFSA4caster will provide you with an estimate of your Expected Family Contribution (EFC), which is an index that colleges use to determine what types of student aid you may receive. Using your EFC, FAFSA4casterwill determine what types of federal grants, loans, and work-study you might qualify for and will provide you an estimated award amount for each. Any student, regardless of age or year in school, may use FAFSA4caster. How Do You Access FAFSA4caster? What Should You Do After Using FAFSA4caster? FAFSA4casterwill provide information on next steps in the financial aid process. Also, in winter of your senior year of high school, you will receive a reminder to complete the FAFSA. Important: After using FAFSA4caster, you should continue to research additional options for financial aid. FAFSA4caster provides you with other sources to check out. The U.S. Department of Education is the main source of financial aid for college, but it isn’t the only source. Visit www.students.gov to find out about education funding available from other federal agencies. Visit Educational Resource Organizations Directory to find out about money available from state governments. Visit a college’s Web site or ask its financial aid office about money the school offers its students. Read the section below about finding scholarships to learn where to look for scholarships from sources other than those listed above. Everyone wants free money to help them attend college. There are many types of scholarships (they don’t all require that you have outstanding grades! ), and they are provided by many different organizations. Each scholarship provider has its own application and its own rules to decide who can get its scholarship. Your job is to find scholarships for which you think you might qualify, and apply by the deadlines. And remember: There is no "secret" scholarship money out there. You don’t need to pay a consultant or join a society just because they say they can help you find scholarships. You can find them yourself and save some money. This section of the article lists what to do and what to explore for difference student grade levels and the parents of those students. Each “To Do List” is broken down by grade level with more details as you get closer to graduation. Visit www.kids.gov to learn about jobs and to find fun games to play online. Start saving for your child’s college education. 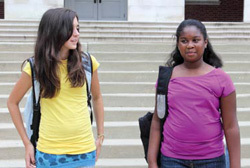 Learn about the tax advantages of state college savings plans and prepaid tuition plans at www.collegesavings.org. Read "Saving Early = Saving Smart!" at www.FederalStudentAid.ed.gov/pubs. This handout explains why it’s never too early to save money for college and how to use such resources as college savings plans and federal student aid. Check out Helping Your Child Become a Reader at www.ed.gov/parents (click on "Helping Your Child") to learn how to create a foundation for learning for children up to age 6. The publication includes activities that make learning experiences out of daily routines and provides a list of resources for parents. Think about college as an important part of your future. Discuss your thoughts and ideas with your family and with people at school. Start saving for college if you haven’t already. Take challenging and interesting classes to prepare for high school. Ask your parent or guardian to help you research which high schools or special programs will most benefit your interests. Do your best in school and on standardized tests. If you are having difficulty, don’t give up—get help from a teacher, tutor, or mentor. Become involved in school-based or community-based activities that let you explore your interests and learn new things. Speak with adults, such as your teacher, school counselor or librarian, relatives, or family friends, who you think have interesting jobs. Ask them, "What do you like about your job?" and "What education did you need for your job?" Visit www.FederalStudentAid.ed.gov/early to find out why you should consider college now and how to pay for it. The Web site also is available in the form of a workbook called My Future, My Way: How to Go, How to Pay. A PDF is at www.FederalStudentAid.ed.gov/pubs. Use FAFSA4caster at www.fafsa4caster.ed.gov to find out how much federal student aid your child might receive. This information will help you plan ahead. Continue saving for your child’s college education. If you have not opened a savings account, you can find information about tax advantages and links to state plans at www.collegesavings.org. Talk to your child about his or her interests and help match those interests with a college major and career. Help your child develop good study habits such as studying at the same time and place everyday and having the necessary materials to complete assignments. Stay in contact with your child’s teachers and counselor so that they can let you know about any changes in your child’s behavior or schoolwork. Keep an eye on your child’s grades on his or her tests and report cards, and help him or her find tutoring assistance, if necessary. Helping Your Child With Homework offers suggestions on assisting your child with successfully completing assignments. Helping Your Child Through Early Adolescence addresses issues that parents of 10- to 14-year-olds generally find most challenging. Work with one of your parents to update your information in FAFSA4caster at www.fafsa4caster.ed.gov, and continue to save for college. Take challenging classes in core academic subjects. Most colleges require 4 years of English, at least 3 years of social studies (history, civics, geography, economics, etc. ), 3 years of mathematics, and 3 years of science, and many require 2 years of a foreign language. Round out your course load with classes in computer science and the arts. Stay involved in school- or community-based activities that interest you or let you explore career interests. Consider working or volunteering. Remember—it’s quality (not quantity) that counts. Talk to your school counselor and other mentors about education after high school. Your counselor can answer questions about what classes to take in high school, how to sign up for standardized tests, and where to get money for college. Check out KnowHow2Go: The Four Steps to College, which suggests some actions you can take as you start thinking about education beyond high school. The online version of the brochure is at www.knowhow2go.org. Get answers to common questions about college: Read the "College Q&A Question of the Week" at www.college.gov. Learn about managing your money in the "Financial Literacy" section of www.FederalStudentAid.ed.gov/ preparing. Continue to talk to your child about college plans as if he or she will definitely go to college. Keep an eye on your child’s study habits and grades— stay involved. Encourage your child to take Advanced Placement ‘— or other challenging classes. Watch videos for parents on the "News Parents Can Use" page at www.ed.gov/parents. Add to your child’s college savings account regularly. Address your concerns about whether your child can or should go to college in the "parents/family" section of www.college.gov. Learn from Help Your Child Improve in Test-Taking at www.ed.gov/parents (click on "Helping Your Child" and then "Archived publications"
Review Every Year in High School of this college planning checklist. Talk to your guidance counselor or teachers about Advanced Placement courses. Find out what courses are available, whether you are eligible, and how to enroll in them. Start planning for college and thinking about your career interests. At www.FederalStudentAid.ed.gov/ myfsa you can register with MyFSA and research your career and college options. Make a list of your awards, honors, paid or volunteer work, and extracurricular activities. Consider participating in academic enrichment programs, summer workshops, and camps with specialty focuses such as music, arts, and science. Visit www.college.gov for some reasons to consider college and ways you can get help. Use the College Savings Calculator at www.FederalStudentAid.ed.gov/myfsa to determine how much you should be saving to meet college expenses and to find tips on maximizing your savings efforts. Make sure you are fully aware of the provisions of any college savings accounts you have opened for your child. Visit www.college.gov and click on "parents/family" to learn how to help your child go to college. Go to www.ed.gov/parents and look around. Consider taking a practice Preliminary SAT/National Merit Scholarship Qualifying Test (PSAT/NMSQT) or the PLAN exam. Plan to use your summer wisely: Work, volunteer, or take a summer course (away or at a local college). Log on to your MyFSA account at www.FederalStudentAid.ed.gov/myfsa and try The Career Finder, or look at your career search results again if you used the Career Finder last year. Then include the recommended majors from the search as you use the College Matching Wizard on the site to find schools that might be a good fit with your interests and goals. Learn the differences between grants, loans, work-study, and scholarships at www.college.gov (click on "how to pay"). Help your child develop independence by encouraging him or her to take responsibility for balancing homework with any other activities or a part-time job. Learn about the standardized tests your child will be taking during 10th through 12th grades: the PSAT/NMSQT, SAT Reasoning Test and SAT Subject Tests (see www.collegeboard.com), and/or the PLAN exam and the ACT (see www.act.org). Get a brief overview of financial aid from "Financial Aid and Scholarships for College" in the "Parents School Box" section at www.ed.gov/parents. Occupational Outlook Handbook at www.bls.gov/oco. Log on to your MyFSA account at www.FederalStudentAid.ed.gov/myfsa and look at the information for any colleges you saved if you completed the College Matching Wizard in the past. Try the college search again if you’ve changed your mind about what you want from a school. Register for and take exams for college admission. * The tests that many colleges require are the SAT Reasoning Test, the SAT Subject Tests, and the ACT. Check with the colleges you are interested in to see what tests they require. Use Financial Aid and Scholarship Wizard to find scholarships for which you might want to apply. Some deadlines fall as early as the summer between 11th and 12th grades, so prepare now to submit applications soon. *REMEMBER: Register for all tests in advance and be sure to give yourself time to prepare appropriately! If you have difficulty paying a registration fee, see your school counselor about getting a fee waiver. Visit www.college.gov and click on “how to pay” to see how other young people paid for college. Learn how to avoid scholarship scams and identity; theft from Save Your Money, Save Your Identity at Looking for Financial Aid Without Getting Scammed. Take another look at your financial situation, and be sure you’re on the right track to pay for college. Talk to your child about the schools he or she is considering. Ask why those schools appeal to your child, and help him or her clarify goals and priorities. Attend college fairs with your child, but don’t take over the conversation with the college representative. Just listen, and let your child do the talking. Get in-depth information on federal student aid programs from Funding Education Beyond High School: The Guide to Federal Student Aid at www.FederalStudentAid.ed.gov/guide. Learn about student and parent loans in Your Federal Student Loans: Learn the Basics and Manage Your Debt. Update your information in FAFSA4caster one last time at www.fafsa4caster.ed.gov, and compare the results to the actual costs at colleges to which you will apply. To supplement any aid FAFSA4caster estimates you might receive, be sure to apply for scholarships. Your goal is to minimize the amount of loan funds you borrow. Part A, "What You Should Know Before You Apply". Part B, "How Do I Apply?," especially the first two sections, "Getting Your Federal Student Aid PIN" and "Completing the FAFSA". Be careful when searching for scholarships: Read Don’t Get Scammed on Your Way to College! at www.FederalStudentAid.ed.gov/pubs. Review your financial situation and make sure your child is looking into or already has applied for scholarships. Find out whether your child has added any schools to his or her college wish list since the last time you visited colleges, and visit additional campuses if possible. Take a closer look at Funding Education Beyond High School: The Guide to Federal Student Aid to ensure you understand the federal aid programs and upcoming application process. Work hard all year; second-semester grades can affect scholarship eligibility. Stay involved in after-school activities, and seek leadership roles if possible. Meet with your school counselor to make sure you are on track to graduate and fulfill college admission requirements. If you haven’t done so already, register for and take such exams as the SAT Reasoning Test, SAT Subject Tests, or ACT for college admission. * Check with the colleges you are interested in to see what tests they require. Apply to the colleges you have chosen. Prepare your applications carefully. Follow the instructions, and PAY CLOSE ATTENTION TO DEADLINES! Well before your application deadlines, ask your counselor and teachers to submit required documents (e.g., transcript, letters of recommendation) to the colleges to which you’re applying. To prepare to apply for federal student aid, be sure to get a PIN at www.pin.ed.gov so that you can complete your application and access your information online. One of your parents also should get a PIN. Encourage your parent(s) to complete income tax forms early. If your parent(s) has (have) not completed their tax forms, you can provide estimated information on your federal student aid application, but remember to make any necessary changes later. As soon after Jan. 1 as possible, complete and submit your Free Application for Federal Student Aid (FAFSA), along with any other financial aid applications your school(s) of choice may require. You can complete the FAFSA online at www.fafsa.ed.gov or on paper, but completing the application online is faster and easier. You should submit your FAFSA by the earliest financial aid deadline of the schools to which you are applying, usually by early February. Refer to FAFSA Filing Time for Students of this checklist as you go through the application process. If you have questions about the federal student aid programs or need assistance with the application process, call 1-800-4-FED-AID (1-800-433-3243) or the TTY for the hearing impaired, 1-800-730-8913. After you submit the FAFSA, you should receive your Student Aid Report (SAR) within three days to three weeks. Quickly make any necessary corrections and submit them to the FAFSA processor. Review your college acceptances and compare the colleges’ financial aid packages. Refer to Part B of Funding Education Beyond High School: The Guide to Federal Student Aid as you work through the FAFSA process. Read the the Why Get a Federal Student Loan? section of this checklist. Work with your child on filling out the FAFSA (see FAFSA Filing Instructions for Parents and FAFSA Filing Instructions for Students for specific instructions). Make sure your child’s personal information is safe when he or she applies for financial aid. For tips read "Student Aid and Identity Theft" at www.FederalStudentAid.ed.gov/pubs. Go to www.irs.gov and visit Tax Benefits for Education to see how you might benefit from federal income tax credits for education expenses. Understand the benefits of federal student loans by reading Why Get a Federal Student Loan? of this college checklist. Help your child learn about the responsibilities involved in accepting a student loan by reviewing Your Federal Student Loans: Learn the Basics and Manage Your Debt wiith him or her. Look at communications from schools to which your child sent FAFSA information. If a school has offered Federal Direct Loans (also called William D. Ford Federal Direct Loans, Direct Stafford Loans, or Direct PLUS Loans), the Direct Loan Basics for Parents brochure might be useful to you. Find it at www.direct.ed.gov/pubs/profpubs.html. If you’ve never been to college, or started but never finished, this section is for you. Need to improve your skills or knowledge? Find a new career path? Look into getting a General Educational Development (GED) certificate if you don’t have a high school diploma; visit www.pueblo.gsa.gov/cic_text/education/ged/ged.htm. Research careers and the need for various jobs in the Occupational Outlook Handbook at www.bls.gov/oco. Use the free College Matching Wizard to find the right school for your career intentions. Check the yellow pages and ask employers to recommend trade schools that will train you in the skills you will need for the career you choose. Search www.FederalStudentAid.ed.gov/scholarship to find scholarships. Apply for federal student aid by following the guidance in FAFSA Filing Time in this checklist and get to know the financial aid staff at the school you plan to attend; they can help you with aid applications and explain the types of aid available. "Need Training for a Job?" "Be an Informed Consumer … when it comes to federal student aid"
Learn about federal funding for your education in Funding Education Beyond High School: The Guide to Federal Student Aid at www.FederalStudentAid.ed.gov/guide. Discover why federal student loans are a better option than private loans in the Why Get a Federal Student Loan? section of this checklist. Use Your Federal Student Loans: Learn the Basics and Manage Your Debt at www.FederalStudentAid.ed.gov/repayingpub to help you determine which loans to accept and how much to borrow. Go to www.irs.gov and read IRS Publication 970, Tax Benefits for Higher Education to see how you might benefit from federal income tax credits for educational expenses. If you want to be considered for aid from your state or college, you must meet its FAFSA deadline. If you plan to go to college in the fall, your state financial aid deadline is probably going to be between March and May; and your college financial aid deadline could be as early as February. The FAFSA site at www.fafsa.ed.gov lists many state deadlines and tells you how to find yours if it’s not listed. For a college’s FAFSA deadline, check the school’s Web site or contact its financial aid office. You must complete and submit the Free Application for Federal Student Aid(FAFSA) to apply for federal student aid—that’s government money for college or trade school. Financial aid offices use information from the FAFSA to determine whether you are eligible to receive federal grants, loans, or work-study funds. States and schools also use the information from the FAFSA to determine whether you qualify for additional aid. In fact, some schools won’t consider a student for the school’s merit scholarships until the student has submitted a FAFSA. So be sure to fill out a FAFSA even if you think you won’t qualify for federal aid. Get free information and help from your school counselor, the financial aid office at the college or career school you plan to attend, or the U.S. Department of Education at www.fafsa.ed.gov or 1-800-4-FED-AID (1-800-433-3243). Free help is available anytime during the application process. You should never have to pay for help. Get a personal identification number called a Federal Student Aid PIN at www.pin.ed.gov. Your PIN lets you "sign" your online FAFSA, access and make corrections to your application information, and more—so keep it safe! Information on savings, investments, and business assets for yourself (and for your parents if you are providing parent information). Apply online (the fastest and easiest way) by going to www.fafsa.ed.gov. Download a PDF version of the FAFSA at the "Forms" section of www.FederalStudentAid.ed.gov/pubs. Fill out the PDF and mail it to the address on the form. Ask the financial aid staff at the college you plan to attend whether you may fill out the FAFSA with their help and have them submit it for you. Call 1-800-4-FED-AID and request a paper FAFSA. Review your Student Aid Report (SAR)—the result of your FAFSA. You will receive your SAR by e-mail or by mail. If necessary, make changes or corrections and submit your SAR for reprocessing. Your complete, correct SAR will contain your Expected Family Contribution (EFC)—the number used to determine your federal student aid eligibility. If you do not receive your SAR within three weeks of submitting your FAFSA, go to www.fafsa.ed.gov and select "Check Status of a Submitted FAFSA;" or you may call 1-800-4-FED-AID. Your school might request additional information from you. Be sure to respond by any deadlines, or you might not receive federal student aid. All applicants: Contact the financial aid office if you have any questions about the aid being offered. First-time applicants: Review award letters from schools to compare amounts and types of aid being offered. Decide which school to attend based on a combination of (a) how well the school suits your needs and (b) its affordability after all aid is taken into account. Keep in touch with the school you’ve chosen to find out when tuition and fees are due, whether your financial aid will cover those expenses completely, and how much (if any) extra financial aid will come directly to you once your tuition and fees are paid. Pay special attention to letters or e-mails from schools, and contact the financial aid office if you do not understand what the school is offering you. Follow all directions on the FAFSA and on any communications from your school. Get your own Federal Student Aid PIN at www.pin.ed.gov. Your PIN will act as your electronic signature on your child’s online FAFSA. File taxes as early as possible, but don’t delay the FAFSA due to your taxes not being done. It’s okay to estimate your financial information on the FAFSA; you just need to finalize it later. Complete the "Students: To Do" list above with your child. If possible, file the FAFSA online—it’s much faster and easier, and your information is safe because it’s encrypted (i.e., we use a mathematical formula to scramble the data). Examine the bill from the school your child chooses and make sure you understand all the fees and how they will be paid (e.g., through scholarships, student loans, etc.). Have Questions about Federal Student Aid and Want to Talk with a Real Person? Call the Federal Student Aid Information Center at 1-800-4-FED-AID (1-800-433-3243) or 1-800-730-8913 (TTY for the hearing impaired). Toll number: 1-319-337-5665. Many of the publications mentioned in this checklist are available to order or download for free at www.edpubs.ed.gov. Find detailed federal student aid information at www.FederalStudentAid.ed.gov. Studentaid.Ed.gov “College Preparation Checklist”, 2009, http://studentaid.ed.gov/PORTALSWebApp/students/english/checklist.jsp, a publication in the public domain.